What does it mean for the future of the World Chess Championship? The game Capablanca - Bernstein, St.Petersburg (preliminary) 1914, is the second in the series of Capablanca's games 'to be studied', between these two opponents. The first was Combination: Capablanca - Bernstein, San Sebastian 1911. The game was also featured as no.83 in Kasparov's 'My Great Predecessors, Vol.1'. Black has regained the Pawn, but an examination of the situation will show that White has an overwhelming position. All his pieces are in play, some in a defensive and others in an attacking position, even the Bishop which does not seem to do much will soon be very effective, while Black has not yet castled and his Queen Rook and Queen Bishop are undeveloped. It is now up to White to take advantage of the position before Black has time to deploy his forces. This verbal assessment shows how the Cuban judged a position. The Bishop 'which does not seem to do much' is the piece on d3. A careful examination will show that Black could not safely take the Pawn on account of Nd5. The object of White's previous move is accomplished. The Bishop no longer holds two diagonals, one offensive and the other defensive, but only one, and as he has weakened the defense of his King it is now time to carry on the assault. This is to my mind the finest move in the game, though all annotators have overlooked this fact. Before making it I had to plough through a mass of combinations which totalled at least a hundred moves. The text combination is one of them, and I had to see through the whole thing to the end before I decided on this move. Otherwise the simple continuation 21.Nxe5 would have been adopted. The point is that 21...Qd7 (forced), allows 22.Nxc8!, although 22.b5 with the threat of 23.Nxc8 is simpler. After 22...Qxc6 23.Qd8+ (23.Nxa7 Rxa7 24.Qd8+ Qe8 25.Qxb6 also wins), Capablanca caught Bernstein's King in a mating net and won on the 43rd move. Did Capablanca misjudge the Meran? Continuing with Capablanca's games 'to be studied', the next game to be studied is Capablanca - Bernstein, St.Petersburg preliminary, 1914. Before I get to the position that Capablanca thought was worth analyzing, I have a small observation on the opening. The game mentioned in the note (Capablanca - Bernstein, Moscow 1914) started 1.d4 d5 2.c4 c6 3.e3 Nf6 4.Nc3 e6 5.Nf3 Nbd7 6.Bd3. This is a line known as the Meran Variation (ECO D47-49). After the further moves 6...dxc4 7.Bxc4 b5 8.Bd3 a6, we have the position shown in the diagram. Here the players continued 9.O-O (D48) 9...c5 10.dxc5 Nxc5, and the game was drawn after 30 moves. The main line of the Meran is 9.e4 c5 10.e5 cxd4 11.Nxb5 (D49). Theory says that Capablanca had 'the worst of the opening', not because of his 'failure to bring out the Queen Bishop', but because he played 9.O-O and 10.dxc5. I had never encountered the idea about the 'theoretical disadvantage of supporting a center Pawn not with another center Pawn but with a side Pawn'. Are there other examples of this? From now each move should be studied with care as the coming endgame is very difficult. I consider it one of my very best. The beginning of a very elaborate plan, the first object of which is to force the advance of one of White's Queenside Pawns, so that the Rooks cannot be free to maneuver and attack Black's Queenside Pawns. Many of the other points, which would take pages to explain, will be revealed by the coming moves in the game. To prevent the White Rook from going to c3. At the same time the attack on the c-Pawn holds the Knight at d4 and keeps a Rook defending the Pawn. Forcing the c-Pawn to advance, which is part of Black's plan. If 30.Rf2 the f-Pawn will soon advance and the Black Rook will go to c3. The plan is maturing. White will have to play 32.a4 and Black can then break through by 32...b5! Now as the Rook goes through, and the King advances to the center, the enormous power of the Be4 becomes evident. The passed f-Pawn will soon advance and the game will be over. Official correspondence from About.com tells me 'You Have Been a Guide Since: 2002-09-19'. I can't believe four years have passed; I'm still just getting started! There is so much to write about in chess and to learn about on the Web. While looking for other references to the game Kaufmann and Fähndrich vs. Capablanca (started in Double blunders can be instructive, the current game in Capablanca's games 'to be studied'), I found that it was ending no.19 in 'Capablanca's Best Chess Endings' by Irving Chernev. 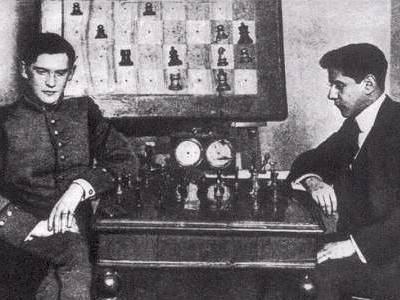 There the game was attributed to Fähndrich and Kaufmann playing against Capablanca and Réti. Chernev introduced the game with a story that Réti was surprised when Capablanca refused to consider a natural developing move at one point in the game. Where had I seen this story before? It was in game 31 of 'The Development of Chess Style' by Dr. Max Euwe. The story concerns the position shown in the diagram. Here Reti commented as follows: "A position was arrived at here in which the opportunity presented itself to develop a hitherto undeveloped piece and indeed with an attack. The move 14...Re8 would have had that effect and was in accordance with the principles prevailing when I grew up and which corresponded almost entirely with Morphy's principles (for he would, without considering, have chosen that move). To my great astonishment Capablanca would not even consider the move at all. Finally he discovered the following maneuver by means of which he forced a deterioration of White's Pawn position and thereby later on his defeat." A weak move; White could simply have played 19.Bg3. Against this Capablanca gave the following variation: 19...Nxg3 20.fxg3 Bxc2 21.Ng4 f5 22.Ne3 Be4 23.Rad1 Qb6 24.Nxd5 Bxd5 25.Qxb6 axb6 26.Rxd5 Rxa2, and Black has won a Pawn -- wlich happens to be virtually worthless. A model of enterprising play in every phase of the game. "With this game," said Reti,"began a revolution in my conviction as to the wisdom of the old principle, according to which in the opening every move should develop another piece. I studied Capablanca's games and realized that contrary to all the masters of the period he had for some time ceased to adhere to that principle." Here, however, we must add that we do not unreservedly agree with Reti's judgment on this remarkable game, for it is not clear that the advantage obtained from the maneuver 14...Bd4 is absolutely forced. ...where the kibitzers mention that Réti's comments first appeared in his book 'Modern Ideas in Chess'. The next game in this series on Capablanca's games 'to be studied' was played by the third World Champion against 'Dr. Kaufmann and Fähndrich'. Gaige's 'Chess Personalia' lists both Dr. Arthur Kaufmann (Romania, 1872-c.1940) and Hugo Fähndrich (Hungary, 1851-1930). Since the dates match on all counts, I suppose these are the players of the White pieces. The diagram shows an example of of a rare occurrence in Capablanca's games, a double blunder. Capablanca played 23...Qf6, and remarked, '23...Kh7 was the right move. The text move exposed Black to a variation, which I thought at the time would win for Black without much trouble, but careful examination will prove this not to be the case. In fact, Black cannot win at all. The Allies replied, 24.Nf3. Capablanca gave the correct continuation as 24.Rxe4 dxe4 25.Rg2+ Kh8 26.Rg6 Rg8 27.Nf7+ Kh7 28.Qxf6 Rxg6+ 29.Ng5+ Rxg5+ 30.Kf2. The Rook is tied to the defense of the f-Pawn and Black cannot chase the Queen away. Many players would lose interest in analyzing the game any further, thinking that the double blunder removes all educational value. Capablanca considered that any position, regardless of its origin, was worth analysis. Here he considered the continuation 'one of my very best' endgames. His approach to chess is a lesson in itself. Unfortunately, this game is not available on Chessgames.com. Continuing with Capablanca's games 'to be studied', the diagram shows another position from Endgame: Nimzowitsch - Capablanca, Riga 1913. That second link points to the full game and has more about the references mentioned here. Capablanca played the natural 29...Bxg4, to which Nimzowitsch replied 30.a4. In 'Basic Chess Endings', Fine gave a long variation starting 30.Ke1, showing that it also lost. This is worth a separate analysis that I didn't do. The game continued 30...Ke6 31.Bb8, and now Capablanca played 31...a5!. This move is one reason the endgame has been included in so many anthologies. The first point of Black's 31st move is that after 32.Bc7, Black has 32...b5!. Fine gives the sample variation 33.axb5 a4 34.c4 a3 35.Ba5 a2 36.Bc3 Kd6 and 37...Be6. After capturing the c- and b-Pawns, Black will have an extra Pawn on both sides of the board, which is sufficient to win an endgame with Bishops of opposite color (BOC). In fact, in any BOC endgame with B+2P vs. B, where the Pawns are disconnected, the Pawns must be separated by at least two files to have winning chances. One file is usually not sufficient to win when the enemy King is in front of the Pawns. White saw this and played 32.Ke1. Now after 32...Kd5 33.Kd2, comes the second point of 31...a5!. White can't go after the Pawn with 33.Bc7, because of 33...Kc6 34.Bxa5? b6, trapping the Bishop. Here Capablanca noted that if White had played 31.Bg7, instead of 31.Bb8, the game would have continued 31...h5 32.a5 a6. One consequence of this is that instead of 31...a5! as played in the game, the move 31...a6 would also have won, although not as quickly. White's problem is that the Queenside Pawns are so weak, that one of them will eventually be lost. This again gives Black an extra Pawn on both sides of the board. After 33...Bd7 34.Bc7 Kc6 35.Bd8 (35.Bxa5 is again met by 35...b6) 35...b6 36.c4 Kb7 37.Kc3 Bxa4, Fine wrote, 'The rest is not difficult.' It might not be diffiult for a GM, but it is worth studying for anyone else. Five years ago we watched in horror and wondered why. Today we remember the victims and still wonder why. The diagrammed position was reached in Endgame: Nimzowitsch - Capablanca, Riga 1913, which has a link to the full game and the references mentioned below. The game is part of a series on Capablanca's games 'to be studied'. Capablanca played 26...c5, assigned it a '! ', and commented, 'The move that gives Black the advantage.' Chernev mentioned that 26...Bxg4 27.Rxf6+ Ke7 28.Rxh6 would be an easy draw for White. If now 27.Rxf3 cxd4 28.Rd3 Rc8 and for all practical purposes Black is a Pawn ahead. My opponent chose the other line of play in order to keep the Bishops of opposite colors, which he thought should give him a draw. Very attractive, but not the best. Nimzowitsch had good chances of drawing by going into a Rook ending, instead of relying on the opposite colored Bishops. 27.Rxf3 cxd4 28.Rd3 Rc8 29.Rxd4 Rxc3 30.Rd7+ Kg6 31.Rxb7 Ra3 32.c4, eventually reaching an ending of two Pawns to three on the Kingside. In the hope of saving himself in the opposite colored Bishop ending a Pawn down. The Rook ending after 27.Rxf3 cxd4 28.Rd3 Rc8! is also unpleasant for White, for example: 29.Rxd4 Ke6 30.c4 Rc5 31.c3 Ra5 32.Rd2 Ra4 etc. The move 29...Ke6, preventing Rd4-d7, is the move Capablanca had in mind when he noted that 'for all practical purposes Black is a Pawn ahead'. He was referring to White's doubled c-Pawns. Endgames with four Pawns vs. three Pawns all on the same side occur frequently. Because both players castle Kingside more often than they castle using other possible combinations of castling (both Queenside, on opposite sides, or at least one player doesn't castle), the four vs. three Pawn structure is seen most frequently on the Kingside. The diagram shows an example where the Pawns have advanced the minimum number of squares. The same structure on the Queenside is just a mirror image. Most endgame manuals have several examples of this endgame showing various combinations of pieces. For example, 'Rook Endings' by Levenfish and Smyslov has five examples of Rook and Pawn endgames played by world class players. The games have Pawn structures that vary significantly from the diagram, but all have the basic structure with Pawns on the e-, f-, g-, and h-files facing Pawns on the f-, g-, and h-files. Another excellent book, 'Endgame Preparation' by Jon Speelman, has an entire chapter titled 'One Extra Pawns but Pawns all on One Wing', where the four vs. three structure is seen in several examples from GM level games. Following Speelman's lead, let's look at the win-draw chances with typical material combinations. No other pieces: The King and Pawn endgame is almost always a win for the strong side. Paraphrasing Fine ('Basic Chess Endings' no.69), 'the extra Pawn is used as a decoy to divert the attention of the enemy King', while the White King captures the remaining Pawns. A minor piece on each side: Fine believed that N+4P vs N+3P is a win for White (no.130) and that B+4P vs B+3P with same color Bishops is a draw (no.130, opposite color Bishops is certainly a draw). In the cases of Bishop vs. Knight, the Knight has an advantage over the Bishop (discussion of no.240). That means N+4P vs B+3P is often a win for White, while B+4P vs N+3P is usually a draw; Speelman mentioned that White's winning chances can depend on having an h-Pawn of the right color for the Bishop. A Rook and a minor piece on each side: Of the different material combinations, this is the least investigated. The basic endgame manuals don't have the space to examine this in detail. My first impression is that the general rule is the same as 'a minor piece on each side', but this is just an impression. I'll watch out for real examples. A Queen on each side: Speelman wrote, 'The extra Pawn gives some winning chances but I believe that with reasonable defense Black should draw'. He gave no examples, but mentioned that Larsen lost the strong side of this ending against Keres. Knowing the basic chances to win or draw in these endings helps considerably when deciding how to simplify from more complicated endings. The next example of Capablanca's games 'to be studied', is a textbook case in handling Bishops of opposite colors. I easily found three other references to the game, each of which chose a different start point. Notwithstanding the Bishops of opposite colors I did not hesitate to exchange. Those who wish to learn should do well in carefully studying this game. It is one of the finest endings I ever played. The game continued 19.f3 Nxd2 20.Rxd2 Rad8. This is the start point for game no.80 in Kasparov's 'My Great Predecessors, Part I'. Kasparov gave White's next move 21.g4 a '?' and suggested 21.Kf2 Re5 or 21.Rfd1 Rd5. The position after 21.g4 is the start point for ending no.18 in 'Capablanca's Best Chess Endings' by Irving Chernev. The game continued 21...Bb5 22.Rb1 Ba6 23.Rbd1 Re2 24.Rxe2 Bxe2 25.Re1 Bxf3 26.Rf1 c5 27.Bxf6 Rd1 28.Be5 Rxf1+ 29.Kxf1 Bxg4, which is the start point for position no.212 in Fine's 'Basic Chess Endings'. ...which I traced to an article by GM Karsten Müller on Garry Kasparov's Great Predecessors. This move I considered a very long time.It looks very simple and inoffensive, yet it is the foundation of the whole attack against Black's position. The fact is that the Bishop is doing very little, while the Black Knight at d5 is the key to Black's defense, hence the necessity of exchanging the almost useless Bishop for a most valuable Knight. It would take a good many lines to explain this move properly, and then I might not be clearly understood, so I leave the student to work it out by himself. Looking first at the alternatives, White would like to play 18.Rc7 but there is the small problem of 18...Nxc7. Another idea is 18.Ng5 attacking the f-Pawn twice. Capturing it by 19.Ngxf7 isn't good because of 19...Rxf7, but Black must guard against the possibility. It is interesting to note that after 18.Ng5, 18...f6 doesn't work because of 19.Nxh7 Kxh7? 20.Nxg6. Another idea is 18.Qa5, eyeing c7, but Black has 18...b6 19.Qa6 Nb4. Alekhine played 18...Bb5. What did Capablanca intend if Black plays the logical 18...Ngf6? The Bishop is attacked, so White can exchange it, defend it, or retreat it. If 19.Bxd5 Nxd5, the Knight which was doing little on g8 has taken the place of the 'most valuable Knight' on d5. Neither 20.Ng5 f6 21.Nxd7 Qxd7 22.Ne4 b6, nor 20.Nxd7 Qxd7 21.Ne5 Qd6, looks convincing. Why should White trade the powerful Knight on e5 for the Bishop blocked by its own Pawns? Perhaps White intended 19.Ng5 Nxe4 20.Nxe4, followed by 21.Nc3 (not 21.Ng4 f5), planning to exchange a pair of Knights. Or perhaps 19.Bb1, planning 20.Ng5 h6 21.Ne4 exchanging a pair of Knights followed by Be4xd5. Now the square c7 is controlled by White, and this decides the game. Should Black attempt to protect it by} 21...Bc6, he will soon lose a Pawn through 22.Nxc6 as White will be able to bring up enough forces and win either the a- or c-Pawn. It should be noticed that Black's weakness throughout the middle game is his inability to command the Black squares. Alekhine played 21...a6, and after 22.Qc7 Qxc7 23.Rxc7 h6 24.Rxb7, White's extra Pawn with a Rook on the seventh rank was enough to win the game. That is impressive enough, but what would the outcome have been after 18...Ngf6? ...on Chessgames.com. Perhaps the many comments on the game there will shed some light on this position.